The two theories of verbal cognition, namely abhihitānvaya and anvitābhidhāna, first put forth by the Bhāṭṭa and Prābhākara Mīmāṃsakas respectively in the second half of the first millennium C.E., can be considered as being foundational as all subsequent thinkers of the Sanskritic intellectual tradition (philosophers as well as ālaṃkārikas) engaged with and elaborated upon these while debating the nature of language and meaning. In this paper, I focus on the first chapter (pariccheda) of Śālikanātha’s Vākyārthamātṛkā and outline the process of anvitābhidhāna described therein. Śālikanātha explains this as comprising three steps, and thereafter discusses each of these three to elaborate upon and philosophically defend this conception of how one cognizes sentential meaning. 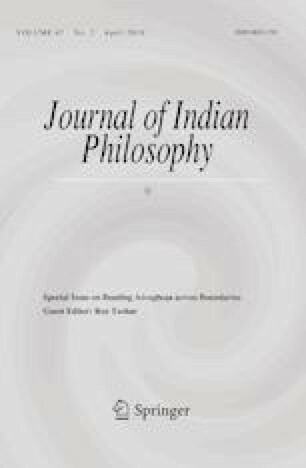 The aim of this paper is to present Śālikanātha’s three-step model, and thus demonstrate especially the distinct conception of abhidhāna (denotation) for the Prābhākara Mīmāṃsakas (particularly Śālikanātha) as complex and chronologically extended as contrasted with the Bhāṭṭa conception of abhidhāna as non-complex and instantaneous. Such an understanding of the disparate semantic contents with which the Bhāṭṭas and Prābhākaras use the identical term abhidhāna is crucial for any correct study of their respective doctrines. Saxena, S. (2018). Linguistic and phenomenological theories of verbal cognition in Mīmāṃsā: A study of the arguments in Śālikanātha’s Vākyārthamātṛkā-I and the response in Sucarita’s Kāśikāṭīkā. PhD Thesis, University of Cambridge. https://www.repository.cam.ac.uk/handle/1810/289760.